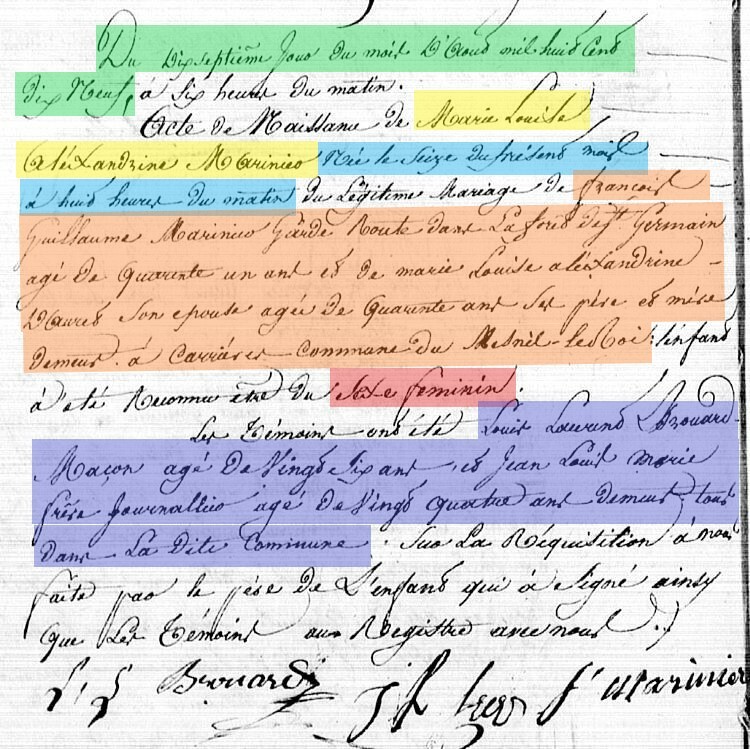 In the year 1792, French parish records were replaced by civil registration. For this reason, documents before and after 1792 provided different information. Here are some examples of the information that we can find about birth and death in the records. Before 1792, baptisms were recorded by priests. 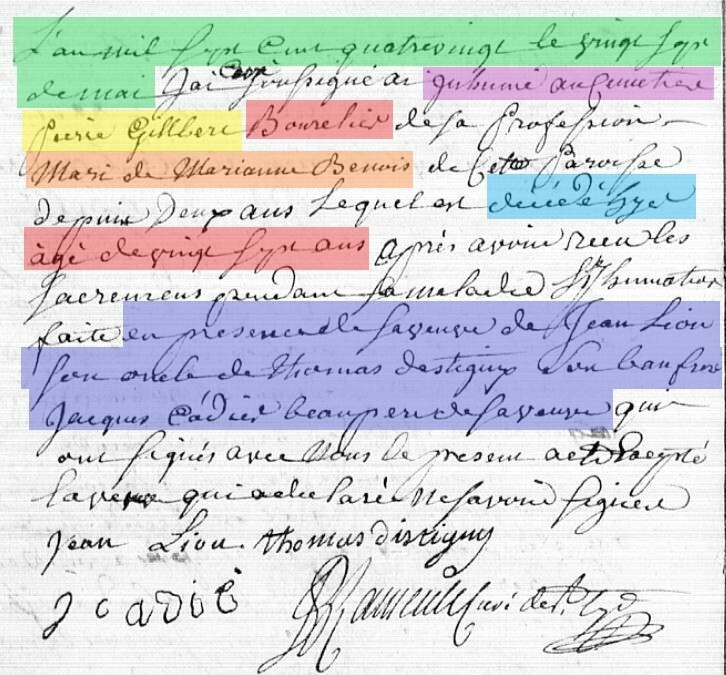 Baptism records gave details about the baptism (its date, the godparents …) but not about the birth itself. The exact date of birth wasn’t always mentioned. However the baptism usually took place within a couple of days after the birth. *** The date of baptism, usually written out in full (“l’an mil sept cent quatre vingt, le quatre d’avril” i.e. the 4th of April, 1780). *** The date of birth, usually mentioned as “born the day before” (“né d’hier“) or “born on the same day” (“né ce jour“) although this wasn’t always stated. *** The gender of the child (“une fille” i.e. a girl or “un garçon” i.e. a boy). *** The given name of the child. *** The names of the parents. This sometimes includes the occupation of the father (here “perruquier” i.e. wigmaker), but rarely more details. *** The name of the godfather and sometimes his occupation (or the name and occupation of his father if he is a minor). *** The name of the godmother (and sometimes the name of her father if she is a minor). After 1792, births were recorded by civil officials. The main difference is that the information is more precise, and additional details are provided about the witnesses and parents (ages, occupations …). 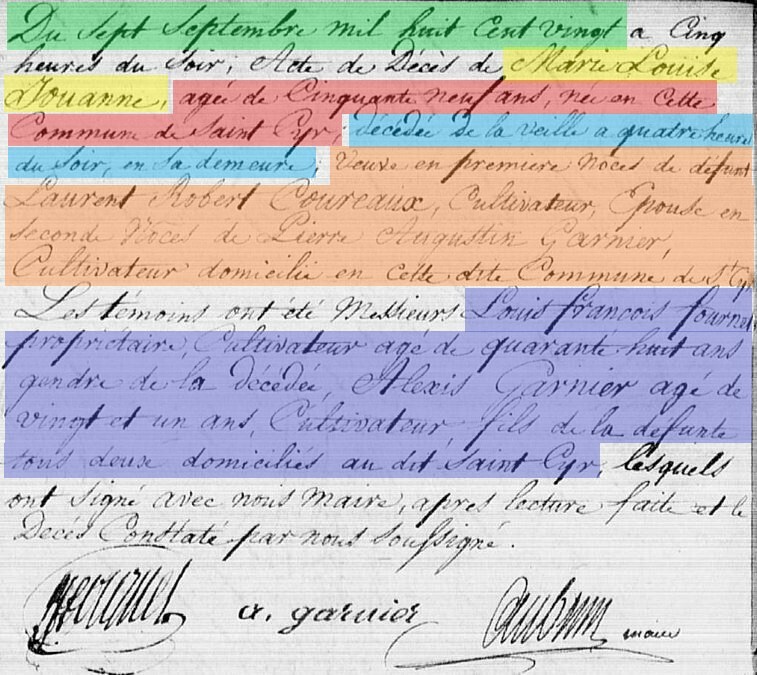 However, this document gives no information about the baptism or the godparents of the child. *** The names of the parents. This frequently includes the occupation of the father (and sometimes of the mother), the ages of both parents and their address. 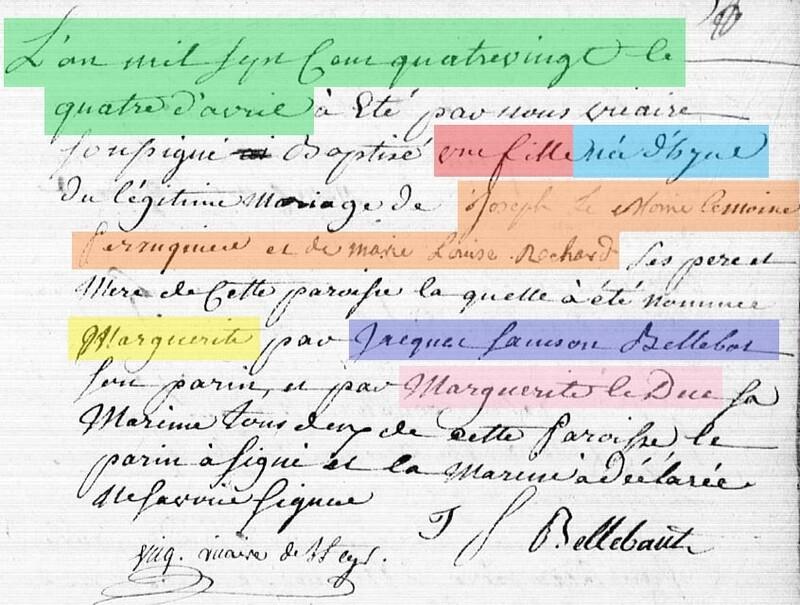 It also mentions if the parents were legally married (“légitime mariage“). *** The names of the two witnesses with their occupation, their age, their address and their relationship to the child (if they were related). Before 1792, burials were recorded by priests. *** The date of burial, usually written out in full (“l’an mil sept cent quatre vingt, le vingt sept de mai” i.e. the 27th of May, 1780). *** The date of death, usually mentioned as “deceased the day before” (“décédé hier“) or “on the same day” (“décédé ce jour“). *** The burial place, usually in the churchyard (“au cimetière“) but people could sometimes be buried in the church itself. *** The name of the deceased. *** The age of the deceased, and sometimes his or her occupation (here “bourrelier” i.e. saddler) but rarely more details. *** The name of the deceased’s spouse or the name of the parents if the deceased was a child. *** The name of the witnesses and their relationship to the deceased. However, this information wasn’t always mentioned. After 1792, deaths were recorded by civil officials. The essential difference is that more details are provided about the deceased and the witnesses. However, this document gives no information about the burial. *** The date of the record, usually written out in full (“du sept septembre mil huit cent vingt” i.e. the 7th of September, 1820). *** The date and time of death, usually mentioned as “deceased the day before” (“décédé hier” or “décédé la veille” ) or “on the same day” (“décédé ce jour“). The place of death can also be mentioned (here “en sa demeure” i.e. at home). *** The age of the deceased, his or her place of birth, and his or her occupation (mostly for men). *** The name of the deceased’s spouse (or spouses if the deceased had been married more than once), or the name of the parents if the deceased was a child. *** The name of the two witnesses and their relationship to the deceased (if they were related). A difference that can also be observed between burial and death records, is that death registers never mention the cause of death. However, we can sometimes uncover clues about the cause of death in burial records, as priests declared if they had time to administer the last rites. Therefore, they frequently provided details about sudden deaths.